As time goes on, the whole issue of an international military response to Syria’s use of chemical weapons becomes tied in a tighter and tighter Gordian knot. Tactically, the military options themselves offer less and less chance for effectiveness as the Syrians prepare themselves both operationally and mentally for an attack. Strategically, the extent and depth of the response is being weighed by the forces of geopolitics: particularly the Russians and Iranians. Not to mention our allies, the Israelis. The international justice framework has shown its typical weakness. Not only has the U.N. refused to sanction military action, but a coalition of the “willing” outside of the U.N. is pretty minimal, particularly after the British Parliament voted nay. France and Turkey seem to be the only major players willing to support action by the U.S. Then, there is American politics. Had Obama not decided to seek Congressional approval, he would have been hounded by Republicans for overreaching his executive powers; now that he has decided to go to Congress, he will presumably be accused of weakening executive powers for the future. Not only that, he is also being labeled as indecisive, weak and giving the enemy too much time. And, finally, there are the unintended consequences of a military strike. No one can predict with certainty what the reactions of the Syrians, the Russians or Iranians might be. Although many are betting that the Syrians will not react in any major way – one never really knows. Although one of the Administration’s major goals is to keep “boots off the ground”, once the first American missile is fired, events will take on lives of their own. So, the fact is that taking military action is essentially a no-win proposition. There is, however, an alternative: the U.S. could launch a humanitarian strike. Instead, of launching a couple of cruise missiles, the U.S. could launch ships, cargo planes and helicopters full of food, medical supplies, building material, blankets, clothes, etc to the refugee camps. It was just announced yesterday that the number of Syrian refugees has passed the 2 million mark. Our assistance would presumably be extremely welcome by Jordan and somewhat welcome by Turkey and possibly Iraq. Granted, this is putting boots on the ground, but the U.S. actually does this all of the time. Every year both USAID and the Department of Defense respond to scores of international disasters all around the world. 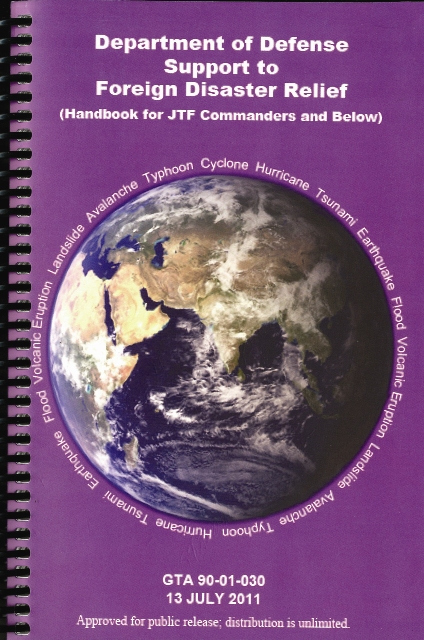 Some of the past disaster response efforts with which the U.S. military has assisted include the 2004 tsunami in Southeast Asia; 2005 earthquake and 2010 flooding in Pakistan; and the 2010 earthquake in Haiti. So, while we constantly provide aid and assistance, it is rarely done with such a great potential strategic benefit. Doesn’t this make a much stronger statement about the use of chemical weapons, than taking mostly symbolic destructive military action? Instead of assuming that the only language the world understands is force, let’s make “the shot across the bow” be helping tens of thousands of innocent people. However, some have said that if the U.S. doesn’t respond militarily, it will show a lack of resolve. But there are different types of resolve, and coming to the aid of the victims of this war seems to be an excellent one. Certainly, there will be unintended consequences of this action – but for a change many of them may actually be positive! We can take the moral high ground and build respect within the international community. We can ask the international community to join us, with particular emphasis on the Russians and the Iranians. They would be hard put to refuse and if they were to engage in this project perhaps it would actually improve the chances for negotiations and diplomacy in both Syria and Iraq. In turn, humanitarian action would enhance our ability to gain support from other nations and the U.N. if the situation deteriorates, and we really do need to build a coalition for military action. It might also have the effect of putting some pressure on both the Iranians and the Russians to change their position on supporting Assad and continuing the violence. Finally, one of the main advantages of a humanitarian strike is that it totally resets the strategic and tactical calculus. As has been said a hundred different ways by a hundred different commentators, the current situation that Obama is in appears to be absolutely no-win – both from a domestic political standpoint and from an international perspective. Therefore, it is time to create a new option. Providing a huge level of humanitarian aid to the refugees sends the right message to all of the parties – and it slices the Gordian knot in half.